The competition is now closed. Please stay tuned for the next opportunity. The first thing that you'll want to do is download the Design Guidelines document by clicking the link below. It will take you to the Design Brief page where you will find an easy reference to the design requirements and links to supplemental documents such as the site boundary, photographs, and reference documents. Please email lagi@landartgenerator.org with questions. REMINDER: Submission Deadline is May 6, 2018. LAGI 2018 invites creatives, scientists, engineers, and others from around the world to submit ideas for large-scale and site-specific public art installations that generate carbon-neutral electricity for Melbourne, Australia. The competition is free and open to everyone. We encourage designers, artists, engineers, architects, landscape architects, university students, urban planners, scientists, and anyone to enter who believes that the world can be powered beautifully and sustainably. There is a cash prize of $16,000 USD for the 1st Place winner and $5,000 USD for the 2nd Place winner. If you have not done so yet, please click on the "register" link on the upper right and create your account. By doing so, you will stay informed as there are updates. Only one team member needs to register. That should be the same user who will upload your team's submission before the deadline. The email you use for registration will be our primary method of contact for all updates and communication with your team. Everything that you will require to begin can be found in the sections below. The theme of the LAGI 2018 competition is "Energy Overlays—the superimposition of energy and art onto an emerging master plan for urban regeneration." The design brief has been carefully crafted with local partners to align with the strategic plans and cultural context of the local site, the city, and the region. Victoria is setting an example for the world with a goal of zero carbon emissions by 2050. Melbourne, already one of the most sustainable cities in the world, is targeting net-zero by 2020. How much of the clean energy infrastructure required to attain these goals will be implemented within urban areas, and what is the impact of these new installations on our constructed and natural environments? How can solar and wind energy be integrated into public spaces in ways that educate, inspire, and are responsive to the history, culture, and nature of place? Melbourne has a rich tradition of ambitious and creative public projects aimed towards advancing sustainable development. The LAGI competition, which brings together multiple disciplines to take on complex problems, is a perfect fit for Melbourne, a vibrant city of arts and culture. LAGI 2018 is being sponsored and hosted by the State of Victoria, Department of Environment, Land, Water, and Planning. Project partners include: the City of Port Phillip, Carbon Arts, Fed Square, and Climarte. LAGI 2018 competition opens: design brief and all supplemental information is available on the LAGI competition portal. Open period for questions. Answers to team questions will be posted periodically on this site and can be accessed by clicking the Q+A link at the top of the page. April 15, 2018 is the last day that questions will be received. Award ceremony, exhibition, and book launch held at Fed Square in Melbourne, Australia. Satellite exhibitions and workshops will be programmed throughout St Kilda, the City of Port Phillip, and the State of Victoria. One representative of the first and second place winning teams will be flown to Melbourne, Australia for the award ceremony and exhibition opening. Award ceremony, exhibition, and book launch held at Fed Square in Melbourne, Australia. Satellite exhibitions and workshops will be programmed throughout St Kilda, the City of Port Phillip, and the State of Victoria. The LAGI 2018 publication featuring the top 50 submissions will be released in October 2018 by Hirmer Publishers. LAGI 2018 is sponsored by the State of Victoria. Click on the links below to learn more about our project partners, without whose support we would not be able to make LAGI 2018 possible. St Kilda is a thriving public transit suburb of Melbourne with a heart of creativity, environmentalism, and social inclusiveness. What makes St Kilda Triangle such a great design site for LAGI 2018 is the overwhelming desire of the community to make something great happen there. This ambition is reflected in a formal process for redevelopment of the site that has been ongoing since the Council adoption of the St Kilda Foreshore Urban Design Framework (UDF) in 2004 and which was given greater momentum following the tragic 2007 fire that destroyed the Palace nightclub. A 2007 development plan was rejected by the community and led to a reorganization of the Council in the 2008 election and a restarting of the community engagement through a co-design process that began in 2011. It is summarized by the St Kilda Triangle Framework for the Future (Orange Document), the St Kilda Triangle Cultural Charter (Blue Document), and the St Kilda Triangle Masterplan (Purple Document). 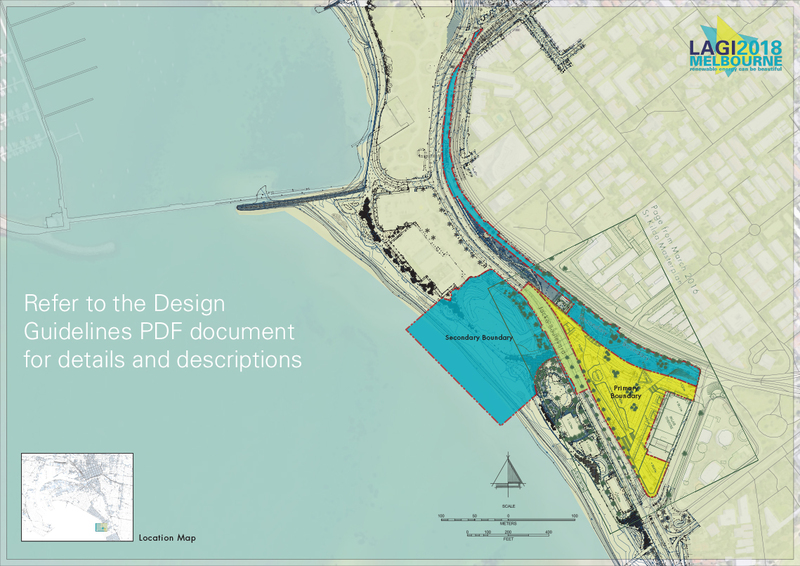 PDF and AI versions of the site plan below are available in the Design Site Boundary ZIP file.